N. Scott Momaday, The Way to Rainy Mountain (1969) set the Kiowa oral history to print, and in the 1994 preface, Momaday explains how the work is split into three voices. The first voice is that of Kiowa oral and ancestral history, the second is a type of historical commentary, and the third is the personal memoirs of Momaday himself. For this reason the entire work is a kind of historiography, or the way in which historians remark, opine and reflect on the works of their predecessors. The importance of The Way to Rainy Mountain is not only that it sets an oral history to print, but also that it allows non-Kiowa individuals access to the depth and scope of Kiowa culture. Momaday demonstrates how the Kiowa interacted with the Great Plains over generations and have a genealogical investment in the landscape. Devil’s Tower illustration by Al Momaday in N. Scott Momaday, “The Way to Rainy Mountain” (1969), 9. 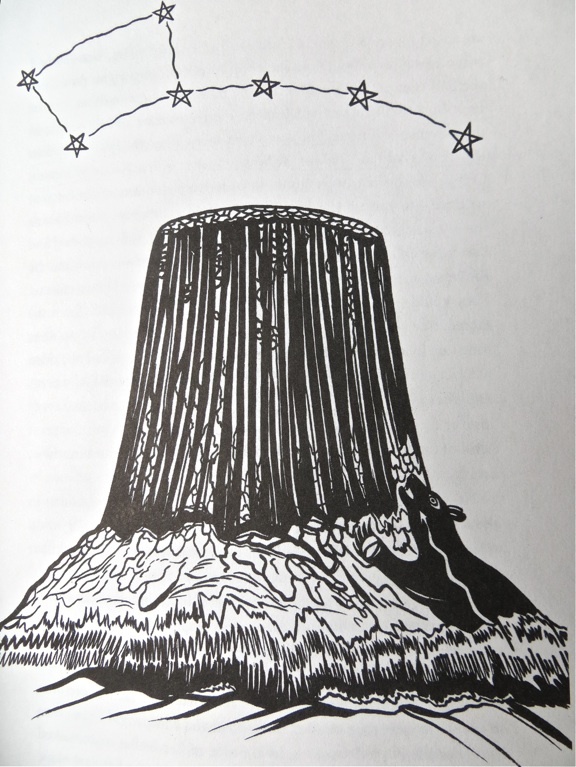 The bear scraped its claws along the base of the tree stump, and eventually the seven sisters rose from the top of this stump into the sky to become the Big Dipper. This story allowed the Kiowa to immediately identify with the Big Dipper, and with today’s Devil’s Tower. So long as the Kiowa were under a clear sky at night, the sight of seven ancestors shining starlight down on them could always provide them with comfort. The second segment of the book, “The Going On,” opens with anecdote, a story about an old man, a wife and child. The child, innocent to the workings of the world, repeatedly asks his mother for food, leaves the house with it, and returns empty handed only to ask for more food. The third time the child returns, but with an enemy. This enemy tells the family of three, “There are many of us and we are all around. We came to kill you, but your son has given me food. If you will feed us all, we will not harm you.” (Momaday, 1969: 44) The old man is highly suspicious of this offer. His wife obliged the enemy’s request and began cooking while the old man secretly led his horses upstream. After bringing his possessions out of danger, the old man “called out in the voice of a bird” to his wife. She then set fire to the animal fat and tallow, threw it on the enemies, picked up her child and ran to the old man. The story might be used to explain the innocence of children, as enemies or malicious people can easily manipulate them. It could also be used to explain how it is wise to be skeptical of outsiders. In the kinship sense, this story also explains how the family of three looks out for one another. The utility of anecdotes and stories such as these in any culture is multifaceted, and even biblical. To understand the Kiowa requires a degree of analogy (In The Landscape of History,  Lewis Gaddis remarked on the importance of analogy for this and other reasons). The Kiowa and other cultures throughout the world infused stories and oral history into the physiography, and by this the culture became interconnected with the landscape and surroundings. Momaday’s 1969 The Way to Rainy Mountain was published almost 25 years after the revolt of the provinces, and almost 4 decades after the publisher of the University of Oklahoma Press called on academics and scholars to study Native America with the same intellectual rigor that they had brought to bear on Mediterranean culture. Momaday’s work also communicates a kind of finality to this culture and others, and this also smacks of Stegner’s Wolf Willow (1955) and Kraenzel’s Great Plains in Transition (1955). Yet at the same time, it also brings about the notion found in Dorman’s Revolt of the Provinces (1993), specifically with John Joseph Mathews, Wah’Kon-Tah: The Osage and the White Man’s Road (1932). When the artists, scholars and literary figures revolted in America’s provinces and periphery during the interwar years (between WWI and WWII), Mathews finally found that the way to preserve and become a proponent of a culture was not necessarily to just recount and study it. (Dorman, 1993: 70-71) This was a part of it, but to truly locate authentic culture required the individual to become a practitioner and contributor to that historic cultural process. In this way, Mathews solved his 1930s dilemma through art, and specifically through Native American Art. Considering that Momaday published The Way to Rainy Mountain in 1969 raises the question as to whether a second volume is necessary to expand on and continue what Dorman ended in 1945. I certainly think so.